Created for excellent performance in compute-intensive applications and commercial HPC environments, the Sun Blade X6275 boasts two world speed records on floating point and integer benchmarks. While the X6275 IB is a wise choice for HPC, dense compute clusters and large I/O applications, the X6275 GbE is meant for enterprise applications as well as commercial HPC. Vibrant offers complete configurations as well as individual parts and upgrades for this model. 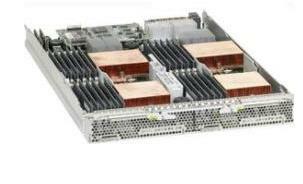 For pricing on new or used Sun Blade servers, upgrades or parts, please contact Vibrant sales at sales@vibrant.com or call 888-443-8606 or 952-653-1700.